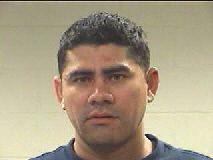 Fransisco Jabiel Caceres, 31, of Livingston has been charged with intoxication manslaughter. Vehicle Rollover Accident takes life of Livingston Man, Alcohol Suspected, LIVINGSTON, April 20, 2013 - A approximately 9:20 pm on April 19, 2013, a red Ford Ranger driven by Francisco Jabiel Caceres, 31, of Livingston, was west-bound on Old Israel Road. Caceres' vehicle left the road to the right. Caceres over corrected to the left and began to roll. His vehicle came to rest upright in the grass on the south side of the pavement in the 2900 block of Old Israel Road. During the rollover, one of Caceres' two passengers (Daniel Diaz, Sr., 41, of Livingston) was ejected from the vehicle and landed a short distance away from the vehicle. Diaz was killed. Americare Ambulance Service was dispatched to the scene along with Officers from the Livingston Police Department including Officer Lenneth Gardner, Sergeant Darrell Newman, Dallas Early, and investigators Matt Parrish and Marty Drake. Caceres and his other passenger were transported from the scene by ambulance and taken to Livingston Memorial Hospital (the other passenger was flown from Livingston Memorial to Hermann Hospital in Houston with serious injuries). Alcohol is suspected and Francisco Caceres was later placed under arrested and charged with intoxication manslaughter. Justice of the Peace, Larry Whitworth performed an inquest at the scene. A first call car from Cochran Funeral Home recovered the body of Daniel Diaz, Sr. A rollback wrecker from LakeView Towing recovered Caceres' vehicle and it will be stored in Livingston. Officer Lenneth Gardner with Livingston Police Department is one of the primary investigators. This Ford Ranger had three occupants. One was killed when he was ejected, the other passenger was flown to Houston, the driver was later arrested for intoxication manslaughter. Justice of the Peace, Larry Whitworth (left) and Detective Marty Drake. Whitworth performed an inquest at the scene. A first-call car from Cochran Funeral Home transported Daniel Diaz, Sr. from the scene. The vehicle was recovered by LakeView Towing.